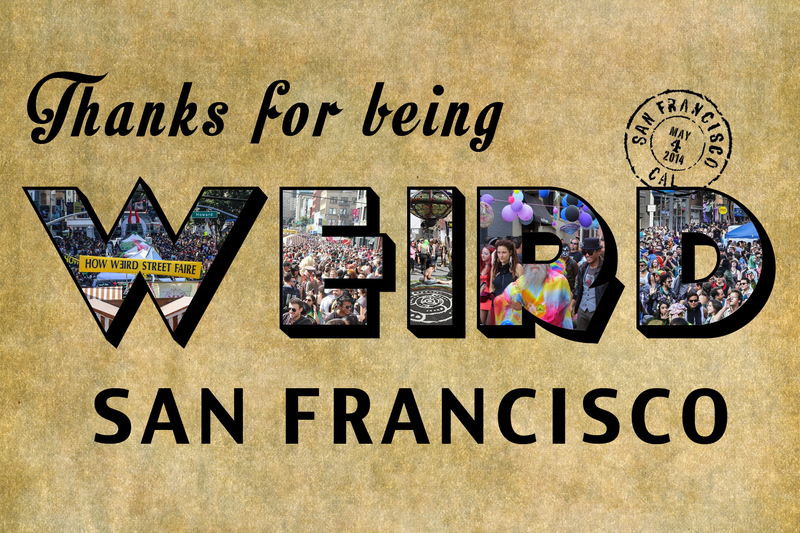 Thanks to everyone who came to How Weird, and showed the galaxy how a street faire should be! Much thanks to all the DJs, musicians, dancers, performers, artists, vendors, and faire participants. We couldn’t have asked for a better start to the legendary San Francisco Bay Area festival season. On May the Fourth, the How Weird Street Faire, for the 15th time, filled the streets of SoMa with a celebration of peace and creativity unlike any other. The faire featured art, music, dancing, performances, technology exhibits, peace activities, unique vendors from around the world, and much more. Thanks to all who participated in the greatest street faire in the galaxy, and the start of the San Francisco festival season. There will program guides to the How Weird Street Faire, while supplies last. Click here for the Map and Introduction. Click here for the Line-ups and Schedule. The How Weird Street Faire is a world-class music festival, featuring the full range of electronic dance music styles. There will be 10 stages of great music, art, and sound systems from some of the best sound collectives on the planet. How Weird 2014 will feature stages by Enchanted Forest, Muti Music, Symbiosis Gathering, Northern Nights, Opel, Opulent Temple, Urge Productions, Space Monkeys, Underground Nomads, Hookahdome, The Boomtown Revue, Pink Mammoth, SF House Music, Temple Nightclub, Party Babas, Red Marines Festival, Pulse SF, THINK YOU CAN DJ Game Show, SomaFM, and more! The How Weird Street Faire is once again participating in National Dance Week this year. As a part of the festivities, there will be a special National Dance Week flash mob at the Cosmic Dance Stage next to the center intersection. An expanded Art Alley will be in a new location this year, on Tehama Street off of 2nd Street. Come see live art, interactive art, local arts and crafts vendors, music, and even a game show! Be creative at the world famous Art Alley. This year, we have a special edition of the world famous Magic Sticker for only $10.